Jalaluddin Haqqani with his son Nasrudin. Jalaluddin Haqqani, the leader of the Haqqani Network and patriarch of the family, has issued a eulogy for his son, Narisruddin, a top facilitator and leader in the group who was gunned down in Pakistan on Nov. 10. In the statement, Jalaluddin praised “the martyrdom of our Mujahideen in their fight against the aggressors” and reiterated that the Haqqani Network operates under the command of Mullah Omar. Jalaluddin acknowledges his son’s death, and offers congratulations from Mullah Omar and the “Mujahideen” for Nasiruddin’s martyrdom. “First of all I would like to congratulate the esteemed Amir ul Mu’mineen (hafidhahullah) [Mullah Omar, the “commander of the faithful”], the courageous Mujahideen and myself on the Martyrdom of a valiant and audacious Mujahid, Shaheed Nasiruddin Haqqani,” Jalaluddin says. He then launches into a lengthy defense of martyrdom and says that numerous Haqqani family members have been killed while waging jihad. “Shaheed Nasiruddin Haqqani was neither the first martyr from our family nor will he be the last. In fact the entire Haqqani family is dedicated to jihad and martyrdom. Seeking martyrdom through the campaign for the supremacy of Islamic government and the defense of our beloved nation is the Haqqani family’s most ardent desire,” he says. “Muslims love to attain martyrdom as ardently as the non-believers love the comforts of this world,” Jalaluddin continues. The Haqqani Network emir also stresses that the “the supremacy of Islamic government in our land” is the primary goal, and that operating under the command of Mullah Omar is key to achieving this end state. “We can only respect their [martyrs’] sacrifices and martyrdoms by working to bring about the implementation of Islamic government and by following the commands of the sublime Islamic Law. And by keeping our battle fronts united around the leadership of Amir ul Mu’mineen Mullah Muhammad Omar Mujahid, by obeying the commands of our leaders, and by working for the prosperity of our wronged nation,” he says. 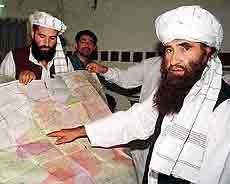 Despite attempts by Western officials and analysts to de-link the Afghan Taliban and the Haqqani Network, top leaders of the two groups have consistently maintained that the Haqqani Network operates under Mullah Omar’s command [see LWJ report, Afghan Taliban condemn the killing of Nasiruddin Haqqani, for details]. Neither the Taliban’s statement condemning Nasiruddin’s death nor Jalaluddin’s eulogy addressed how he was killed. The Afghan Taliban said only that he was killed “in a cowardly terrorist attack of the enemy ….” The Movement of the Taliban in Pakistan accused Pakistan’s Inter-Services Intelligence Directorate, the military intelligence service that often backs jihadist groups, of killing the Haqqani Network commander. Nasiruddin was gunned down outside a bakery run by Afghans in the Bhara Kahu area of Islamabad, an area known to host Afghan and other jihadists. The unidentified shooters were riding motorcycles when they attacked him. Four days after the attack, no group has claimed credit for killing Nasiruddin. A range of actors, including the CIA, Afghan Intelligence, the Inter-Services Intelligence Directorate, rival jihadist groups, and criminals, have been accused of assassinating Nasiruddin. Although it is not known who killed Nasiruddin, Pakistani police and the Inter-Services Intelligence Directorate appear to have attempted to cover up his murder by removing evidence, according to the BBC. Pakistani security forces also facilitated the removal of Nasiruddin’s body from Islamabad to North Waziristan. “A relative of Mr Haqqani told BBC his body had been spirited from Islamabad to the town of Miranshah in North Waziristan – roughly six hours drive across two provinces and one federal tribal territory, all dotted with heavily-manned military and police checkpoints,” the British news service reported. The murder of Nasiruddin in Islamabad is embarrassing for the Pakistani government, military, and the ISID. While the Pakistani state has long been known to support the Haqqani Network, the government and security forces have denied such claims and said the group is an Afghan entity. Pakistan has rebuffed US and Western pleas to take action against the group in North Waziristan, where the Haqqani Network is headquartered. Nasiruddin served as a key financier and facilitator for the group. He also served as an “emissary” to al Qaeda, and often traveled to Saudi Arabia and the United Arab Emirates between 2004-2009 to carry out fundraising for the Haqqani Network, al Qaeda, and the Taliban [see LWJ report, US adds Haqqani Network, Taliban leaders to list of designated terrorists, for more details on Nasiruddin and his terrorism designation]. Additionally, he is believed to have served as a liaison between the Haqqani Network and other jihadist groups, such as the Movement of the Taliban in Pakistan, that are operating in the tribal areas.